Can romantic-minded Salina accept the changes in her life while growing up in 1949 in the Smoky Mountains of Tennessee? ALA BOOKLIST STARRED REVIEW, HORNBOOK, "FINELY CRAFTED & ENGAGING." Celebrate 16-year-old Sacagawea's achievements as she travels 6,000 miles from North Dakota to the Pacific Coast and back again. KIRKUS, "INTRIGUING & WELL-WRITTEN." SACAGAWEA, WESTWARD WITH LEWIS & CLARK: KIRKUS, "INTRIGUING & WELL-WRITTEN"
"The best place to discover new historical fiction." "Society of Children's Book Writers and Illustrators"
"SinC into a good mystery." Starred Kirkus Review ~ Awarded to Books of Exceptional Merit ~ "One hopes that White's clever tale, meticulously researched and pleasingly written, is the first in a series that will bring Florence and its many famous denizens to life." Library Journal: "Intrigue and danger...the author's knack for describing settings is stellar." Publishers Weekly: "Fans of historical mysteries will thoroughly enjoy this chance to visit the Italy of 1480 in the company of real-life historical figure Guid'Antonio Vespucci, a Florentine lawyer. Backed up by sure-handed storytelling and scrupulous research into the period, White creates richly evocative descriptions of Renaissance-era Florence certain to please the amateur historian and armchair tourist." Along with his nephew, Amerigo Vespucci, Italian Renaissance lawyer Guid'Antonio Vespucci investigates crime in 15th-century Florence . . . . "If you've ever been to Florence, or you are going to Florence, or you want to go to Florence, if you've ever whiled away an afternoon in the company of Renaissance masters in an art museum--or if you just want a really good read filled with color and intrigue, a story peopled with characters who are at once exotic and humanly familiar in their universal lusts, passions, fears and ambitions, then this mystery, set in Renaissance Italy, is for you. Through Alana White's elegant prose and skillfully integrated research, the 15th-century City of Flowers comes to life." Brenda Rickman Vantrease, author of "The Illuminator" and "The Heretic's Wife"
Like My Author Page on Facebook, please. 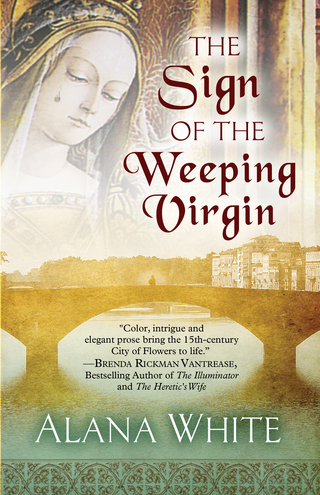 "THE SIGN OF THE WEEPING VIRGIN"
In the summer of 1480, Florentine lawyer Guid’Antonio Vespucci and his nephew, Amerigo, return home to Italy from a wartime mission only to find their dreams of peace shattered. A young girl has been kidnapped, and a centuries-old painting of the Virgin Mary is weeping in Guid'Antonio and Amerigo's family church. Fearful Florentines interpret these disturbing events as signs of God's wrath for their support of the city's leader, Lorenzo de' Medici, and Lorenzo's refusal to end his personal war with Pope Sixtus IV. Faced with losing control of the city, Lorenzo enlists Guid'Antonio to investigate the weeping painting. Now, following a seemingly unrelated trail of clues—a name whispered in the marketplace by a hooded monk, a secret message Sandro Botticelli has painted in a fresco in the Vespucci church—Guid’Antonio and Amerigo chase across fifteenth-century Florence to the workshops of Leonardo da Vinci and Botticelli, to churches where colorful frescoes fly off the walls, from Florence to San Gimignano, where the kidnapped girl disappeared, and, finally, to the hilltop town of Vinci, where Guid'Antonio uncovers the thought-provoking truth about the girl and the Virgin Mary's mysterious—and miraculous?—tears.